To Cite: Shirzadi S, Doshmangir P, Asghari Jafarabadi M. Explaining the Role of Health Belief Model Constructs On Physical Puberty Health Among Teen Girls: Structural Equation Modeling, Women Health Bull. 2015 ; 2(3):e23873. doi: 10.17795/whb-23873. Background: The puberty as a stage of life is an important developmental process. Teen girls have numerous health care needs and their specific aspects should be considered. Objectives: In this study we applied explanatory model to determine the role of health belief model constructs on physical puberty health among teen girls. Materials and Methods: This correlational cross-sectional study was conducted in 2011, and attempted to determine the total, indirect and direct effects of health belief model construct on physical puberty health behaviors. The population studied included 61 girls aged from 12 to 19 years from welfare boarding centers in Iran (Tehran), and selected by convenience sampling method. Data on demographic characteristics, health belief model constructs and physical puberty health behaviors were collected using an interview-based questionnaire, and analyzed by structural equation modeling. Results: The perceived variables such as susceptibility, severity, benefits, barriers and cues to action showed their direct effects on physical puberty health behaviors. Also perceived benefits affected physical puberty health behaviors indirectly through perceived susceptibility. The total effect of perceived benefits on physical puberty health behaviors was 0.292. There are positive significant relationships between perceived susceptibility, perceived benefits, perceived barriers and physical puberty health behaviors as well as path coefficient. SE for each of them were, (0.27 (0.11)), (0.32 (0.09)) and (0.2 (0.06)), respectively. Conclusions: Since benefits of physical puberty health behavior were the most important predictor of this puberty health behavior, it is concluded that increasing the benefits along with improving each of the perceived susceptibility, severity, barriers and cues to action can lead to increasing physical puberty health behavior and health promotion. Maturation indicates a process of growth and is considered as an important stage of life which leads to sexual activity and fertility (1). Primary and secondary changes of sexual organs are signs of physical changes that occur during puberty (2). According to 2011 report of the census bureau in Iran, 16.34% of the population are aged from 10 to 19 years (3). Adolescent girls have several specific health care needs which deserve fulfilling (4). The first menstruation in all cultures signals the crucial moment entering adulthood (5) Poor menstrual health leads to some genital infections (6). The increasing number of orphans and children lacking shelters is an important issue which should be addressed by taking appropriate measures (7). According to the Iranian Statistical Center, there are more than 4,000 children in boarding centers in Tehran, the capital city of Iran (8). A comparison between girls living in welfare boarding centers and those who stayed with their families showed statistically significant difference in health behavior regarding hygienic practices during menstruation; lower scores were obtained among girls living in welfare boarding centers (9). Another study conducted by Zare et al. showed that Knowledge of girls about puberty health was poor and associated with false beliefs (10). Today, various theories of psychology and social sciences with potential effects, such as health belief model (HBM) have been used by health education and promotion scientists to achieve behavioral changes (11). This model was designed by a group of psychologists in 1950 to explain health related behaviors (12). It also highlights the relationship between health belief and behavior (11), and includes dimensions such as perceived susceptibility, referring to beliefs about the likelihood of getting a disease, perceived severity involving feelings about contracting a serious illness or leaving it untreated in terms of evaluations of both medical and clinical consequences such as death, disability, and pain and possible social consequences like those affecting work, family life, and social relationships. In the same context, perceived barriers are defined as the potential negative aspects of a particular health action, and perceived benefits reflect personal beliefs in taking possible measures to reduce severity of diseases; cues to action refer to various early formulations of the health belief model including the concept that can trigger actions (13). Health Behavior Model (HBM) implies that behavior change is the result of variations in social cognitive determinants, which needs to be considered in intervention strategy (14). In our society, due to cultural and non-religious aspects most teenagers, especially girls, are denied to receive appropriate information regarding the physical and psychological changes of puberty. Therefore inappropriate and irrelevant information resources cause both physical and psychological problems (15), which should be discarded in order to promote a healthy lifestyle. To our knowledge, there is no study about predicting adolescent puberty health behavior in connection with the health belief model constructs. The present study was therefore conducted to explore the direct, indirect and total effects of health belief model constructs including perceived variables such as susceptibility, severity, benefits, and barriers and cause to action on physical puberty health behaviors among teen girls. This cross-sectional study was conducted in Tehran, the capital city of Iran in 2011. The study population comprised 61 girls aged from 12 to 19 years, with no physical or mental disability who had at least three menstrual periods, from welfare boarding centers in Tehran, selected by convenience sampling method. Data were collected by personal interviews, using a structured questionnaire approved by the Ethical Committee of Tehran University of Medical Sciences, Tehran, Iran. Informed consents were obtained from the participants before starting the study. The questionnaire consisted of three parts including demographic questions, HBM construct questions, checklist about puberty and menstrual health behaviors. 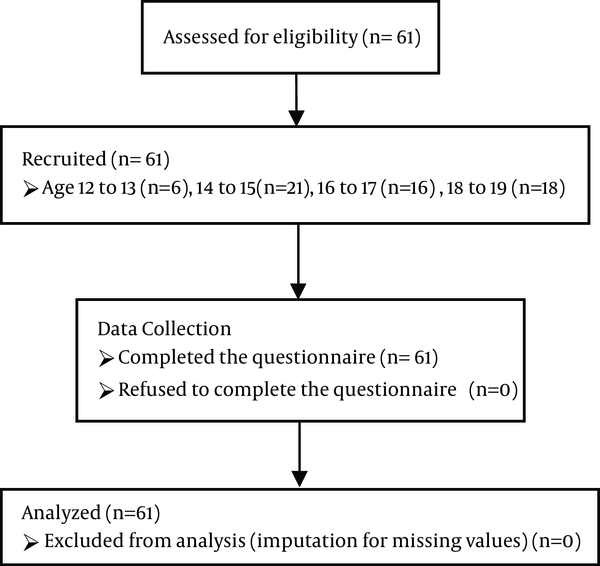 Qualitative content validity of the questionnaire was verified, and changed where necessary, by ten health education and promotion professionals. Reliability was calculated with internal consistency (Cronbach's Alpha) that determined values for each constructs ie. Perceived variables of susceptibility (0.68), perceived severity (0.81), perceived benefits (0.73), perceived barriers (0.87), and physical puberty health behaviors (0.79). These consisted of information about age, level of education, the age upon entry to welfare boarding centers, and the date of first menstruation. This scale included 5 items with scores ranging from 5 to 25 on risk of iron deficiency anemia, influence of diet, use of cosmetic creams, risk of exposure to infections because of not changing underwear daily, and bathing in sitting position. These items were rated according to a five-point Likert Scale from 1 for strongly agree to 5 for strongly disagree. This scale included 5 items with scores ranging from 5 to 25 about seriousness of the iron deficiency anemia, the effect of deficiency anemia in reducing learning ability, lowered resistance to infection, threatening reproductive tract infections and the risk of infertility due to lack of personal hygiene as rated according to a five-point Likert scale, ranging from 1 for strongly agree to 5 for strongly disagree. This scale included 6 items with scores ranging from 6 to 30 rated according to a five point Likert scale ranging from 1 for strongly agree to 5 for strongly disagree. These items included interest in low intake of flatulent food, getting cleaned when using toilets, taking iron supplements, using cotton and bright colored underwear, bathing, and light exercises during menstruation. This scale included 7 items with scores ranging from 7 to 35 on barriers of bathing, light exercises during menstruation, inaccessibility to iron supplements, lack of access to sanitary napkins, asking embarrassing questions about puberty and menstruation, lacking knowledge about the characteristics of menstruation. Items were rated according to a five-point Likert scale, ranging from 1 for strongly agree to 5 strongly disagree. This scale included 1 item (yes/no question) with scores ranging from 0 to 1 on health behaviors and puberty related to adolescence sources of information, including TV, radio, book, magazine and etc. The checklist used to investigate the behaviors consisted of 21 items with scores ranging from 1 to 21 about nutrition, iron supplements, bathing, considering cleanliness, using sanitary napkins and hygienic cotton underwear with light colors, daily activities, exercising, methods of controlling pain, referring to physicians when having severe pain, skin care and control of acne, genital tract health, changing sanitary napkins and methods of disposal. AMOS22 and IBM SPSS Statistics, Meadville, USA were applied to make sure that the health belief model constructs fit the data extracted from participants. Multiple imputation in expectation–maximization (EM) algorithm method was run to manage missing data (16). The structural equation modeling (SEM) tool was used to determine the relationship between health belief model constructs and physical puberty health path analysis. Based on HBM it is proposed that there is a correlation between perceived variables including susceptibility, severity, benefits, barriers and cues to action and physical puberty health. Direct, indirect and total effects among these variables were measured. In the theoretical model, it is assumed that health belief model constructs influence physical puberty health behaviors. In the theoretical model, it is assumed that health belief model constructs influence physical puberty health behaviors. Path coefficients and correlations were considered as standardized estimates. The values for Goodness-of-fit index GFI, adjusted goodness-of-fit index AGFI range from 0 to 1 and are derived from comparisons between the hypothesized model and the independent model, where a value greater than 0.90 was an acceptable fit to the data (17). P-Values less than 0.05 were considered as statistically significant. The mean age of participants was 16.08 ± 1.9 SD years, of whom 9.8 % (n = 6) aged from 12 to 13 years, 34.4% (n = 21) from 14 to 15 years, 26.2% (n = 16) from 16 to17 years and 29.5% (n = 18) from 18 to 19 years. The study flow diagram and demographic variables are shown in Figure 1 and Table 1, respectively. The model fits the data based on the fitness of indices and their reasonable values (GFI = 0.968, AGFI = 0.928). The effects of health belief model constructs on physical puberty health behaviors are displayed in Figure 2. The present study indicated that cues to action directly affected physical puberty health behaviors, and identified perceived variables including susceptibility, severity, benefits, and barriers. Moreover, perceived benefits indirectly affected physical puberty health behaviors through the impact of perceived susceptibility. The path coefficients are shown in Figure 1. 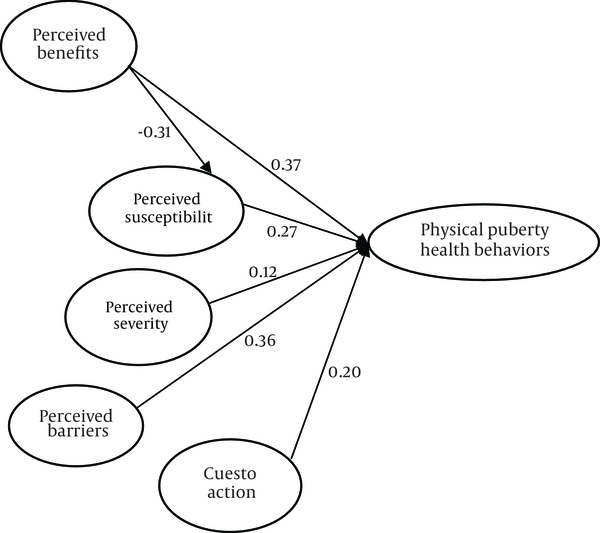 According to path coefficients, perceived benefits were the greatest predictor of physical puberty health behaviors. Also perceived barriers and perceived susceptibility were important factors that affected physical puberty health behaviors next to perceived benefits. The three paths were significant in predicting physical puberty health behaviors (Perceived susceptibility-behavior, perceived barriers-behavior, and perceived benefits). Tables 2 and 3 show Descriptive Indicators of Health Belief Model Constructs and Physical Puberty Health Behaviors and The Total, Direct and Indirect Effect of Health Belief Constructs Factors on Physical Puberty Health, respectively. a Significant at 0.05 level. The promotion and self–care of women are regarded to be inextricable (18). Models and theories facilitate health education and health promoting activities. Models through multiple theories provide particular frameworks to investigate health behaviors (19). Health beliefs are crucial in predicting and understanding these behaviors (20). The present study applied path analysis to identify the appropriate strategy for improving physical puberty health behaviors. Figure 2 shows HBM diagram which depicts both direct paths and indirect effects of constructs on physical puberty health behaviors. In this study, perceived variables including severity, susceptibility, barriers, benefits as well as cues to action have direct effects on predicting physical puberty health behaviors. Moreover, as demonstrated in Figure 2, the perceived benefits directly and indirectly affect physical puberty health behaviors through perceived susceptibility. Perceived benefits were the most important factor for predicting physical puberty health behaviors, next to perceived barriers (13). These results are consistent with those of other studies that indicate perceived benefits and barriers are strong predictors of some health behaviors such as cervical screening, condom use, crash helmet and seat belt applications (21-24). The current findings support the hypothesis that health behaviors are affected by perceptions of high benefit and low barrier in relation to puberty health. Li et al. investigated the relationship between health beliefs, social pressure and exposure to environmental tobacco smoke among high school students, and demonstrated that highly perceived susceptibility to disease was significantly associated with exposure to lower levels of environmental tobacco smoke (25). Higher perceived susceptibility is associated with greater likelihood of adopting preventive behavior (26). In addition, understanding the severity and complications of the disease is the main component of the health belief model in promoting preventive behaviors (27). As attitudes influence behavior, they must be identified, modified and reinforced before providing training program (28, 29). Finally regarding the impact of education on the behavior of young girls, stakeholders and health planners should properly recognize the relationship between attitudes and perceptions with behaviors before planning for relevant educational interventions. The present investigation indicated that perceived benefits had direct and indirect effects on physical puberty health behaviors. According to Path analysis of HBM, awareness about the benefits of health behaviors is the most important point to improve the physical puberty health behaviors, and is a prerequisite for removing the perceived barriers to health behaviors. The present study has not explored the circumstances of individuals, sensitivity to maturity and specific issues of adolescence. Moreover, the results obtained are specific to the girls of Tehran Welfare Centers and are not extrapolated to other parts of Iran and other groups of girls. This study was approved by deputy chancellor for research of Tehran University of Medical Sciences under code number 14266. The authors are most grateful to Tehran University of Medical Sciences for the partial funding of this research, and also wish to thank all colleagues who kindly assisted us during this research. Likewise, we express our deepest gratitude to Tehran Welfare Organization for providing facilities in the course of the present investigation.